According to the research of Uzbek dance specialist Dr. Laurel Victoria Gray, it was the Bolshevik campaign after 1924 to eliminate the custom of veil wearing that lead to public dance performances by women. Dr. Gray writes: "Born in Margilan, Ferghana, in 1906, Tamara Khanum was one of the first women to defy tradition and perform unveiled, often courting death at the hands of Basmatchi reactionaries. (One of her colleagues, a young dancer named Nurkhon, was murdered by her own brother for dishonoring the family by dancing in public. Nurkhon later became the subject of a musical drama by Kamil Yashin)". After graduating from the Moscow Theatrical College, Tamara Khanum was selected to be part of the delegation of USSR artists to the 1924 World Exhibition in Paris, where she performed Uzbek dances and songs. This was the first time in modern history that Central Asian dance had been seen in the West. (1924 was also the year that Isadora Duncan performed in Tashkent and Samarkand). 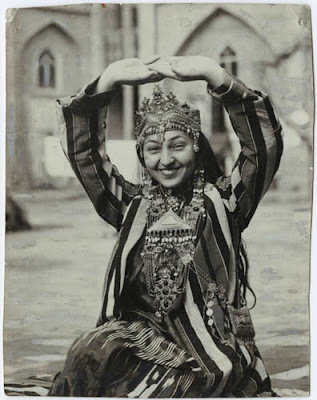 At the end of 1930s Tamara Khanum collaborated with composer Evgeny Grigoryevich Brusilovsky to create the first Uzbek ballet, Gulyandom, in which she performed the lead role. She also established the first ballet school in Tashkent and composed her own original genre 'song-dance'. During World War II Tamara Khanum was a member of the front theatrical companies: she gave more than 700 concerts to the troops, and donated her Stalin Prize to the Fund of Defence. In the 1950s she toured Austria, Norway, Poland, Czechoslovakia, Mongolia, Indonesia, India, Pakistan, Afghanistan and China to great acclaim. Tamara Khanum was awarded the title of the People's Artist of the USSR and many other government awards. She died in 1991. On an Uzbek Journeys tour, you will visit the Tamara Khanum museum, located in her former house in Tashkent. In 2008, the museum received a $34,000 grant from the U.S. Ambassadors’ Fund for Cultural Preservation to revitalize and expand exhibits. The museum has used the funds to restore 75 costumes the dancer wore as she performed around the world, create a new exhibit of hundreds of historical photographs, record an audio guide for visitors to learn about the life of Tamara Khanum, and to improve the display of the museum’s exhibits. A new exhibition area displays hundreds of photographs with captions in Uzbek, Russian, and English. The photos include pictures of the dancer and the musicians with whom she performed, black-and-white scenes of life in Uzbekistan in a bygone era, and posters advertising her international performances. Together they tell the story of the dancer’s life, as well as that of a changing cultural landscape as Uzbekistan evolved throughout the 20th Century. You can view rare 1939 archival footage of Tamara Khanum dancing at the opening of the Ferghana Valley canal, one of the most remarkable achievements of the Soviet Union in this 2-minute video clip. A footnote on these images: the upper photograph was taken by Langston Hughes, the American poet, who described Khanum as "Soviet Asia's greatest dancer". 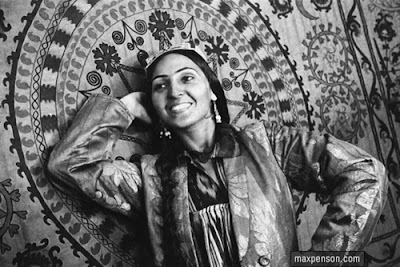 The famous Uzbek photographer, Max Penson, captured her in the lower image.